I planted a half segment (500 sq. ft.) of broad beans today. It took less than an hour. Once these initial plantings are up, I will wait for development, and then put in more sub-segment plantings right through June. By staggering the timing of plantings this way, I can have continuous production and sales throughout the summer. Then I'll relay the area to another crop. 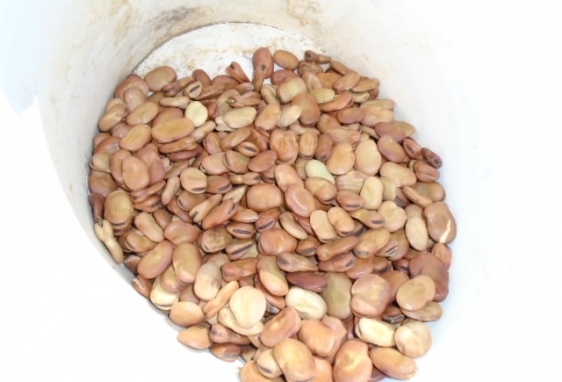 Broad beans are easy to plant and grow. 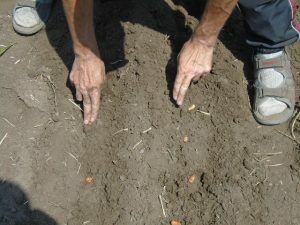 The Earthway seeder does not have a plate to accommodate them, so you need to do it by hand. All you have to do is set up the beds, and press the bean into soil. Then rake over the bed. 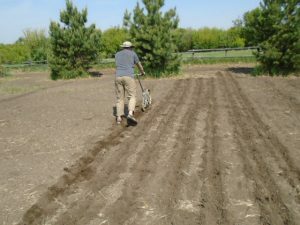 Your work rate should be about 10 minutes per bed to seed. Germination is more or less certain. I've grown broad beans for years, and they have always been a good niche crop. But now that there is a new generation that partly defines itself by how adventurous they can be with their eating, there is even more demand. Just don't call them broad beans. Call them fava beans. They're a good crop to try to attract a new market, or see if you can inject some new enthusiasm into your existing one.